ate and Jon Henderson have devoted the past decade to looking after their 67-year-old mother, Sally, who has dementia. At first the siblings, who, until this February shared their bungalow in Rottingdean, near Brighton with her, were able to cope. But as Sally’s condition worsened, she began to lose her balance and had to use a wheelchair. Her speech deteriorated so much that Jon and Kate had to anticipate her needs by reading her body language. They installed a wet room, a disabled access door and a hospital bed with rails. So when Lucy Frost, dementia lead at Sussex community NHS trust, referred them to a specialist dementia nurse in 2016, they leapt at the chance. Admiral nurses, trained and supported by the charity Dementia UK, focus on the family carers of those with the condition. The Hendersons’ Admiral nurse, Helen McBryer, helped them secure state funding [continuing healthcare]so their mum could stay at home, as well as providing much needed emotional and practical support. And when they decided it would be best for Sally to move into a nursing home, McBryer helped them find one. Without McBryer, the Hendersons say their lives would have fallen apart. “I don’t think we could have got to this place without Helen,” says Jon, 41. “She is our rock”. The Hendersons’ story is far from unique. New research shows that Admiral nurses not only improve the lives of those with dementia and their families, they also save cash-strapped NHS and local authorities money because they reduce the numbers going into care homes and inappropriate acute hospital admissions, as well as cutting referrals to GPs and psychological therapies. In March 2014, the London borough of Sutton hired an Admiral nurse in partnership with Dementia UK and NHS Sutton clinical commissioning group (CCG), with the nurse’s salary (around £50,000) funded by the CCG and the council. The pilot proved so successful that in 2015 the service was expanded to four Admiral nurses who now work with over 200 people in the south London borough. South Norfolk CCG, meanwhile, claims its three Admiral nurses saved £440,000 in health and social care costs between March and December 2013. In February 2013 the service was rolled out across central Norfolk, and is run by South Norfolk, North Norfolk and Norwich CCGs. The CCGs co-fund the service with Dementia UK for two years and recruitment is currently under way to increase the number of Admiral nurses to seven. The total investment, shared equally between the three CCGs and Dementia UK, is £700,000 over two years. “Admiral nurses deliver a great service which has a big impact on the quality of life of people living with dementia in Norfolk – and their loved ones,” says Dr Liz Waddy, dementia clinical lead for South Norfolk CCG . Southampton General was the first acute hospital in the country to introduce an Admiral nurse service in 2012 – it now employs two. It is one of 12 hospitals throughout the UK to provide this service and has also created a 28-bed dementia-friendly ward that is specially designed to minimise the confusion that those with dementia can experience in hospital environments. Jeni Gleeson, Admiral nurse clinical specialist at Southampton and her colleague, Jackie Petley, support clinical teams to improve the hospital experience for people with dementia and their families. “As a result of this approach, the increased confidence of trust staff to care for this patient group has led to a reduction in the cost of employing agency staff,” says Gleeson. NHS England acknowledges the benefits that specialist dementia nurses can bring. Alistair Burns, NHS England’s national clinical director for dementia, describes Admiral nurses as invaluable. “They may delay, or even avoid, hospital and care home admissions for people with the condition,” says Burns. Yet despite dementia now being the leading cause of death among the oldest people, there are still only 200 Admiral nurses in the UK (compared to the UK’s 4,000 Macmillan cancer nurses). 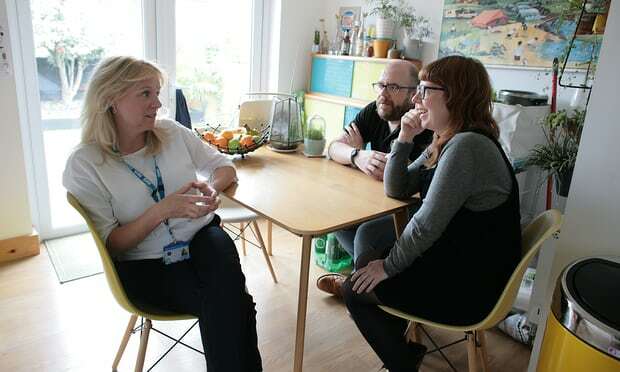 Figures from Dementia UK show that 72 work for the NHS in the community, 13 in acute NHS hospitals, six in hospices, 24 in care homes, 57 in the voluntary or social care sector and 22 on the dementia helpline. Another six Admiral nurses have been recruited and are awaiting referrals. And while some counties have several nurses, 73 have none (including Lancashire, Leicestershire and Somerset, which all have high numbers of people diagnosed with dementia). According to Dementia UK, the problem is that some cash-strapped CCGs are reluctant to spend £40-50,000 per Admiral nurse, regardless of any financial benefits. “The CCGs’ response is that we have an ever-shrinking pot of money allocated and the local community’s needs have to be prioritised,” says Hayo. Back in Rottingdean, the Hendersons are convinced that McBryer has kept their mum out of residential care for much longer than would otherwise have been possible.